uuid : 4d6ad098-4a9d-468c-96b3-7ecc851250d0 templates_id: 119538 templates_uuid: "03a71dbc-ada8-4c1e-aeac-dc4272aeb398" title: "Gross Misconduct Dismissal Letter - Summary Dismissal Letter" display_name: "Gross misconduct dismissal letter" meta_keywords: "Gross misconduct dismissal letter " description: "
Make sure you follow proper disciplinary procedures when you summarily dismiss an employee following a disciplinary hearing, with this instant dismissal letter. Use this summary dismissal letter when you want to dismiss an employee without notice or payment in lieu of notice for gross misconduct and you have held a disciplinary hearing to consider the matter. It covers the date of the hearing and its findings, the facts relied on to establish gross misconduct, the non-necessity of prior warning, the termination date including the fact that the notice period does not apply, arrangements for final salary payment and the right to appeal against dismissal. 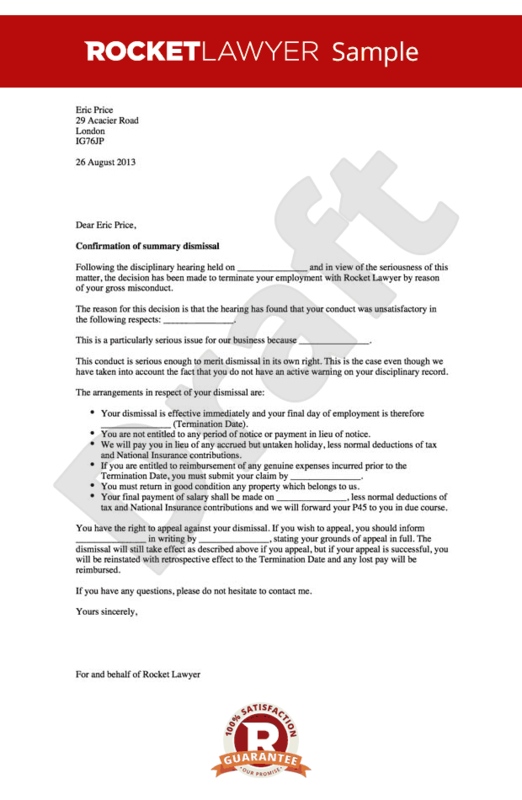 What is a gross misconduct dismissal letter? Normally employers cannot sack an employee on grounds of misconduct without an initial warning and notice being given. However, if an employee commits a serious offence (known as gross misconduct) which requires their swift removal from the workplace, a summary dismissal is possible. In this scenario, a letter dismissing an employee on grounds of gross misconduct should be used to set out the reasons for their dismissal and formalise the process. Why do I need a gross misconduct dismissal letter? Employers are required to set out a decision to dismiss an employee in writing, under the Acas Code of Practice on Discipline and Grievance. Failure to do so can result in an employment tribunal increasing any compensation award by up to 25% (eg. if unfair dismissal claim is successfully brought by the employee). Other than complying with the Acas Code, as a general rule, employers should document their disciplinary processes, to ensure they have written evidence of any decisions made, together with the reasoning, in case the matter ends up in court. This is particularly the case in situations of summary dismissal, which can easily end up being classed as unfair dismissal if the correct procedures are not followed or documented. What should be included in a gross misconduct dismissal letter? The right to appeal against dismissal. Should there be a hearing before dismissing someone for gross misconduct? Even in cases of summary dismissal for gross misconduct, employers are still legally required to hold a hearing and properly investigate any allegations made against the employee. The employee has a right to be accompanied at the hearing. Failure to hold a hearing prior to dismissal can result in a claim of unfair dismissal. When is gross misconduct dismissal appropriate? Although there are no specific rules regarding what constitutes gross misconduct, the offence should be either deliberate or amount to gross negligence, and should destroy the relationship between employer and employee. Examples of gross misconduct include theft, violence, endangering the safety of other employees and breach of a drugs or alcohol policy. Can an employee appeal a dismissal for gross misconduct? Employees have a legal right to appeal their dismissal for gross misconduct. If they decide to invoke this right of appeal, an appeal hearing should be held, chaired by someone different (ideally more senior) to the chair of the initial hearing. The employee also has the right to be accompanied at the appeal hearing. Under the Acas Code, it is vital to inform the employee of their right to appeal and their right to be accompanied, in writing.
" created_timestamp: "2018-10-08 04:36:44.0" modified_timestamp: "2018-10-08 04:36:44.0" active: true created_by: 236 modified_by: 236 dcm_id: 243 url_slug: "Letter-to-an-employee-confirming-summary-dismissal" meta_description: "Create a gross misconduct dismissal letter with step-by-step guidance from Rocket Lawyer. Ensure you follow acceptable disciplinary procedure when an employee is summarily dismissed for gross misconduct. Try our summary dismissal letter template." time_to_complete: "15 minutes" role1: "Employer" role2: "Employee"
More than just a Gross misconduct dismissal letter template, our step-by-step interview and guidance makes it easy to create your document. Easily create online, download, print and sign your free Gross misconduct dismissal letter in minutes. This document is also sometimes called: Gross misconduct dismissal letter .